Honda is reportedly ready to reintroduce a name that hasn't been in the lineup for 16 years, the Passport, as a two-row crossover. The first Passport, introduced in 1994, was honestly a proof of concept, as the automaker wanted to see the public's reaction to a Honda SUV. They borrowed a vehicle made by Isuzu, the Rodeo, and rebadged it as a Honda and sold it for eight years. It served its purpose quite well. 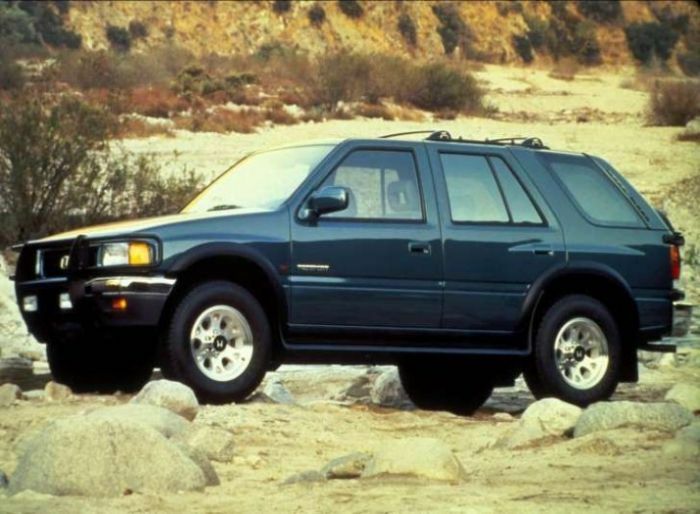 Roughly 24 years ago, give or take a day, Honda dropped a model called the Passport off at my driveway for the usual evaluation that I was writing for newspapers at that time. Though I did like the Passport, in many ways, I also found it was a bit too much like the Isuzu Rodeo for my tastes. There was a reason for this. The Passport was a rebadged Rodeo, masquerading as a Honda. If they looked anymore alike, you would have thought they were corporate twins, not a competitors. That was my take. My wife’s take, though, was quite different. After driving it for a bit, she wanted us to keep it (we pay the same prices you do, believe me, there are no "auto writer" specials). Cautious by nature, there were very few evaluation vehicles that she wanted to remain in the driveway -- and I did everything I could to accommodate her -- but when we ran the numbers to see if we could afford the buyout from Honda corporate, it wasn't in the cards. Most people probably either don’t know or remember that Honda’s first attempt at an SUV neither was the CR-V nor the Pilot. No, it was the Honda Passport. Because the CR-V and Pilot have been around forever, it is easy to forget the Passport. It was the automaker's "proof of concept," so to speak. Honda used Passport to test the waters to find out if the public wanted a Honda SUV. They didn't have to wait long as the Passport proved quite popular. Passport went on to sell for eight years until Honda pulled it. However, it achieved its goal by satisfying nervous Honda execs who were worried an SUV might not fit into their lineup. As CR-V and Pilot and HR-V have shown, SUVs were right for Honda. And with 2018, there are strong rumors that Passport will be back, debuting at next fall's LA auto shindig. Don't be surprised if you see stories and blog pieces speculating about the new model starting soon. One thing to remember is that any piece discussing the Passport should remark that it is a reboot of an earlier model. If it omits this key piece of information, opting, instead to be a "rah-rah look what Honda's doing, isn't it great style piece," my advice is find another story discussing the Passport by someone with heavy-duty auto writing chops. If you cannot find a more authoritative piece on the Passport, remember two things as you read a report breathlessly announcing the “brand-new” Honda Passport's debut at LA in the fall: 1. The Passport isn’t a brand-new model. It is a reboot of and earlier model that proved quite useful at making its point that there was room in the market for a Honda SUV and 2. The Passport, driven by a four-cylinder powerplant, was an SUV that would be accepted by a different type of consumer, one who would be family-oriented; one who chose an SUV because of its built-in practicality as a people- and cargo-hauler. The typical consumer also expected quality workmanship. Looking specifically at the new version of the Passport, according to a story from Automotive News, Honda execs see the new model as slotting in between the CR-V and the Pilot. Citing an anonymous source within Honda, the industry’s leading trade paper says the new crossover (intermediate-sized) will be a two-row crossover. Six inches shorter than the Pilot, it is destined to compete against the Ford Edge, Nissan’s Murano and Hyundai’s Santa Fe Sport. The earlier iteration of the Passport lasted eight tough years on the market. Since it was a badge-engineered vehicle that was supposed to be thought of as a Honda, instead of an Isuzu masquerading as a Honda, there were some issues during its eight-year run. For example, when it debuted, the Passport employed an underpowered Isuzu inline four. The engine was buzzy, and it ran out of breath in the top end of its range. It took lots of energy to move the all-wheel-drive SUV, so it is little wonder a 205-horsepower six appeared quickly. And, even though it had all-wheel-drive, the Passport was a boulevardier. It looked great in its native medium, the streets of center cities all over the country. However, once you moved into more than say six inches grass you were in trouble. Frankly, the Passport looked great, turning many heads and linking the name to an SUV, but, there were issues. Its ride was bouncy, and it tended to roll and wallow like a wide-bottomed boat in a relatively light cross-chop. It wasn’t set up for off-roading. Overall ride comfort wasn’t great, but that wasn’t the point. The Passport looked right, and that was the story people took away. The Passport reboot will likely be built, using the same platform as the three-row Pilot Honda's Lincoln, Ala. plant. The same facility also makes Pilot and Odyssey, the automaker’s successful people-mover minivan. The new Passport is reportedly the automaker’s answer to giving its dealers another entry in the white-hot crossover market. There was not comment from Honda.